First Floor Studio Apartment in charming historic building overlooking gardens. A spacious studio apartment with separate kitchen and shower room. The apartment sits within one of Torquay's beautiful Victorian villas in the leafy and desirable Wellswood area of Torquay. It is a five minute drive or bus journey to Torquay harbour and town centre or alternatively a twenty minute walk. Wellswood has a centre very much like a village and this is five minutes away so guests at Muntham can reach a pub, restaurants, delicatessen, patisserie, post office and much much more in just a few short minutes. This studio apartment is located on the first floor of the building and overlooks the gardens at the side. It benefits from having a separate newly refitted kitchen which is equipped with a full sized cooker and hob as well as a microwave combination oven, an eye level oven, a dishwasher and a coffee maker. We supply a complimentary welcome pack of teas and coffees etc. The main living space has a luxury pocket sprung king size bed. (UK size 5 foot width). All bedding and towels are included in the rate and for guests staying more than 7 nights we offer a complimentary bedding and towel change as well as a light clean. The studio also features a table and chairs so that guests on business can work and this doubles as a dining table that can comfortably sit two. In addition there is a comfy sofa where guests can relax. There is a flat screen TV with built in DVD player and guests are welcome to make use of the owners' own collection of DVDs. There is also a digital radio. The apartment has a newly refitted bathroom with electric shower and a complimentary welcome pack of toiletries is included here. Guests can also make use of the communal laundry which is located at garden level. The laundry has coin operated washers and dryers and ironing facilities. We provide complimentary detergent. Free wifi is also included as are all bedding and towels. There is free onsite parking for all guests. Before purchasing Muntham in April 2016 we had owned and run The Somerville boutique B&B for twelve years. Our passion is for quality and excellence and for delighting our guests with something special. We are easy going and relaxed in our approach but beneath the surface we are paddling light fury to make sure all is as it should be. Muntham is a wonderful building that has survived extremely well. It has been lucky in that its previous owners have obviously loved it and taken care not to rip out stunning original features. It also has fantastic gardens that come to nearly an acre. This really does give you the feeling that you are in a tranquil oasis away from the cares of the World. The apartment has an ensuite shower room with electric shower. The apartments are located in the Wellswood area of Torquay. this is a leafy residential area just five minutes by car from the harbour and town centre. 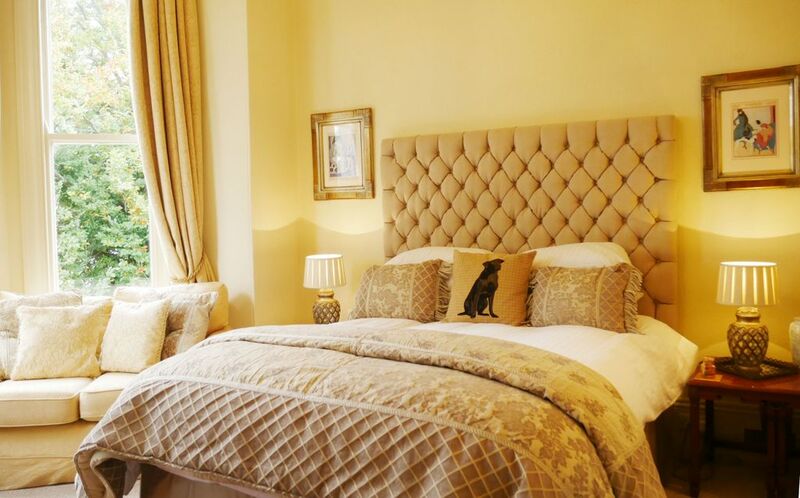 For guests staying more than 7 nights we undertake a full bedding and linen change. We have a communal laundry room at garden level, There are coin operated washing machines here. We offer complimentary detergent. We have a communal laundry room located at garden level. There are coin operated dryers here. One parking space is allocated per apartment. if guests bring more than one vehicle, there is additional free and unrestricted on street parking in Barrington Road immediately outside the property. Kitchen has a full sized oven with electric hob, a microwave, and coffee maker. The TV has a built in DVD player. Guests are welcome to borrow DVD's from the owner's collection. The TV has a built in DVD player. Guests are welcome to borrow DVD's from the owners' own collection. Grant and Adam were wonderful hosts with lots of knowledge of the area and wonderful suggestions for activities. They were pleasant every time we asked questions or needed anything. The apartment was modern and had some wonderful amenities such as the welcome items, a heated towel rack, coffee press, black out curtains, comfortable bed, and quality linens. We used the washers and dryers. It was a great solution for allowing us to pack fewer clothes. We walked to stores, restaurants, the Kent Caverns, and the harbor. It’s a great location. The number 22 bus was a five minute walk if you wanted to go further. We would definitely stay here again. Thank you so much for your lovely review we are thrilled that you enjoyed your stay at Muntham and I hope you will return to see the improvements we are working on ! Excellent in every way. We were given a one bedroom apartment instead of the studio we had booked which was a pleasant surprise. Quiet. Well appointed. Comfortable, clean - just lovely. Would have no hesitation in recommending to others. Would love to go back some day if we come back to the UK! Everything we needed for a relaxing stay with great host support and close access to neighborhood dining, deli, shopping. Very well appointed apartment with everything needed for short or longer term stay. Was greeted by owner/manager who was very friendly and gave us lots of tips for local restaurants as well as places to visit during our stay. Perfect place to stay for short or longer term visits to this beautiful part of the UK.